Today we are showcasing Jennifer's fabulous card. It epitomises the glorious summer weather we are having at the moment. 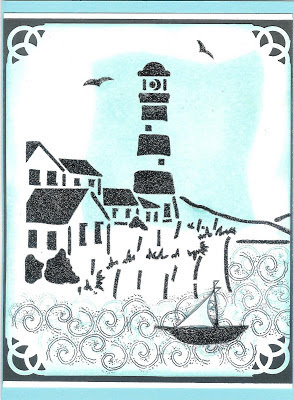 As the weather is beautiful and sunny I decided to show you another seaside card. stencil is laid onto the card, the lighthouse will be in the centre of the coloured nestie shape and the rest of the image will be outside the shape. Colour in the shape of the nestie with the blue distress ink. Lay the stencil over the inked card and spread the black stars sparkle medium over the stencil using the palette knife. Remove excess medium and return to jar. Carefully lift up the stencil and leave the image to dry. When dry, blend the distress ink around the card edges and stamp the swirl stamp in blue then in black to represent the sea. Punch all four corners with the corner punch.Matt the image onto the black card. Stamp the boat onto white card using black ink. Colour the sail with blue distress ink and the boat with black stars sparkle medium. Cut out the boat and fix to the sea using silicone glue. Well our Sue has been crafting this weekend! Playing with new products that will hit our screens on 11 July 2013 at 11.00 pm on QVC. Jealous I hear you say, Yes is my answer! Here is what she has made it looks fantastic! I am sure you will agree. "Sue is going back to her Paint Effect roots!! 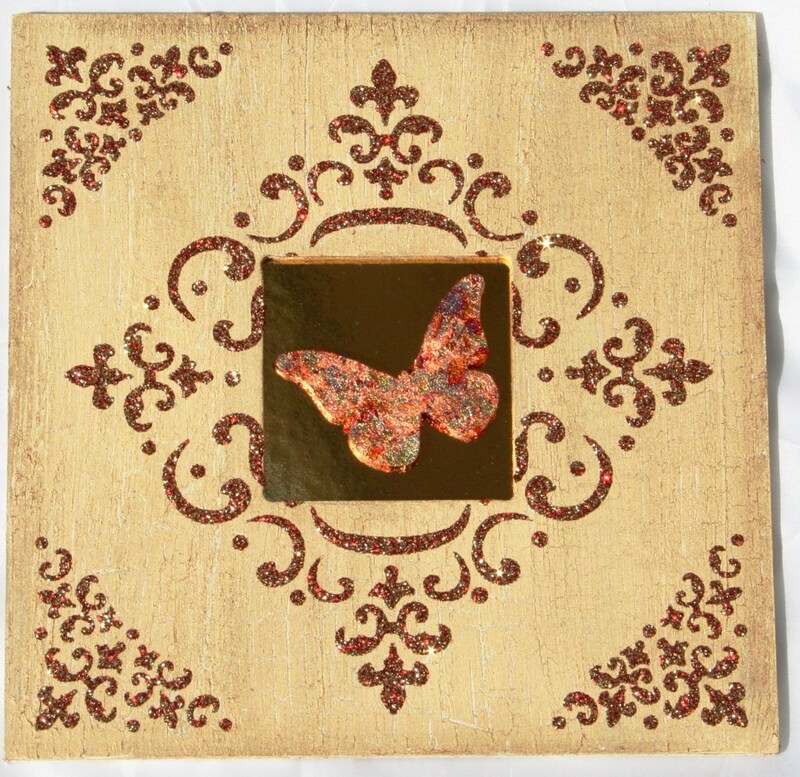 Using the brand new Imagination Paint and MDF kits to be launched on QVC on 11 July 2013. 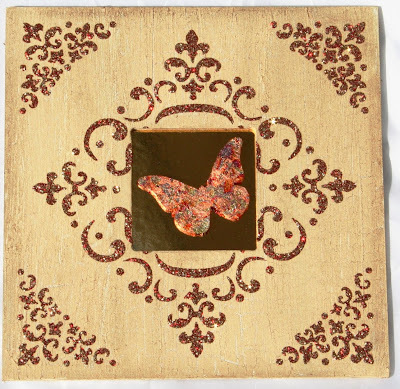 Sue has painted and antiqued 6 x 6 MDF sheets, using MDF paint, Imagination Crackle Medium, Gilding Flakes on the Butterfly Charm, Gilding Wax and Ruby Gold Sparkle medium with the stunning new Frame Stencils Jayne has designed for the Show. The Crackle and Gilding Wax don't show up as well as they should on a photo but in real life it is a real class piece..................watch this space for more to come. "